And since we are talking about numbers, I’d like to put some more facts before you, which I have managed to compile. We have worked with more than 150 freelance writers writing in to us from across the country, and these writers come with varied levels of experience. Writers work on a variety of projects that cover fields as diverse as legal, health, e-commerce, entertainment, travel, medical, and real-estate, to name a few. There are also alternative niches like doomsday, 2012, astral healing, gay rights, fake news and conspiracy theory websites, so you can take your pick, really. If you think about it – you really don’t get on-demand information for alternative niches in any source other than the Internet. That’s good news for all 2012 Doomsday websites and good news for those of us in the content industry. What’s interesting to note here is that we’ve continued to grow at a rapid pace. 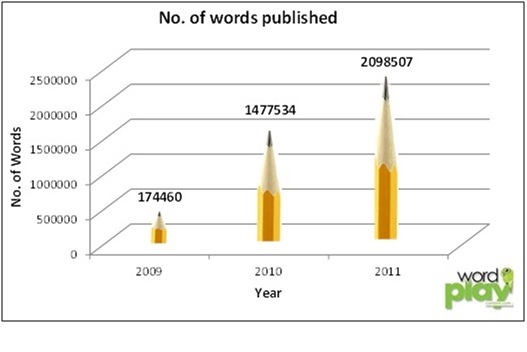 The number of words published till date increased by 42% last year, which, going by current estimates, seems like something we’re already poised to scale this year. 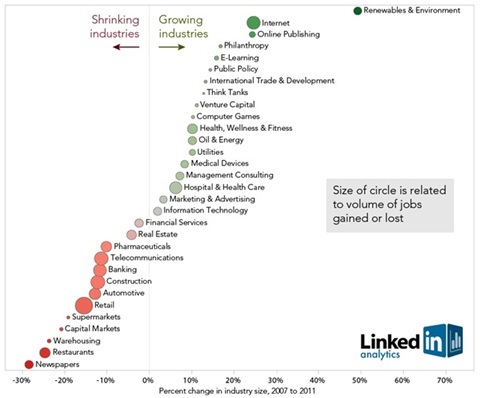 If this infographic from LinkedIn compiled using US data is to be analyzed, two of the fastest growing industries from 2007 to 2011 were the Internet and Online Publishing industries. And newspapers faced the brunt of it all, as the industry declined by almost 30% during the same period. As Robert Niles of Online Journalism Review says “That’s the future of journalism right there”. The search engine market grew by 62% in 2010with over 220 billion searches in 2011, according to comScore. The 300 million websites added in 2011 is another evidence of the growing power of the internet. But such positive numbers can’t be quoted for the print media industry in India, whichis growing at just 10% yearly. With 395 million copies in print, newspapers are limited in readership with the number of pages in publication. However, content on the internet has no such constraints and since every website requires original and unique content, the market for information is leveled. This means consumers don’t have to chose between A or B, and what you end up with is hundreds of news sites and portals and niche sites, competing with each other to dominate a particular vertical or niche in the market. There is a constant need for innovation in a market like this and this should benefit Internet users tremendously at the end of it all. That’s the end goal, isn’t it? The content published on the internet is no longer under the domain or control of journalists. Citizen Journalism has taken over the content industry, with housewives, students, nurses, doctors, graduates, working professionals, and teachers contributing content online. 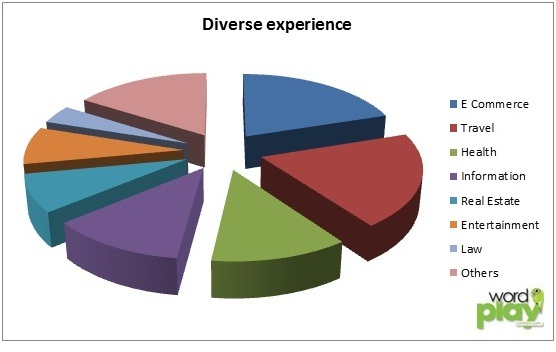 Numerous opportunities exist for freelance writers who want to write from home. This opens up a lot of space for voicing out opinion, when compared to a newspaper that caters only to a particular audience. The constraints are really no match, especially considering niche magazines and newspapers cost extra, but the Internet model of data consumption is free. We have worked with more than 150 freelancers writing in to us from across the country, hence being a part of this growing industry. Additional income as a part time job, no time constraints and mobility make this job attractive for the citizen journalist.Users get free, on-demand information wherever they are and have web masters competing with each other on content. With more information coming to the Internet and more companies taking the digital route, I think we have a lot to look out for in the coming future in this industry. Cheers to that! Earnings for freelance writers associated with us have also gone up from Rs. 5000 p/m to over Rs. 16000 p/m. We have been receiving feedback from our writers regarding our work processes and the quality of work that we expect, and I’m happy to see that most of it is positive and encouraging. Perhaps expecting to cross the milestone of getting 10 million words published on the internet sooner than we think is not a bad idea after all. We certainly seem to be in the right market for it! Wordplay Content is a full-service content writing agency that works with some of the biggest brands in India. Learn more about our content writing services or contact us .